Make your bathroom look like new with this chic, useful piece from Kingston Brass. Make your bathroom look even fresher with this dual-control faucet. Add more beauty to your bathroom with this item's easy-to-install, deck mounted design. This faucet is WaterSense certified so you use less water to get clean and help the environment. 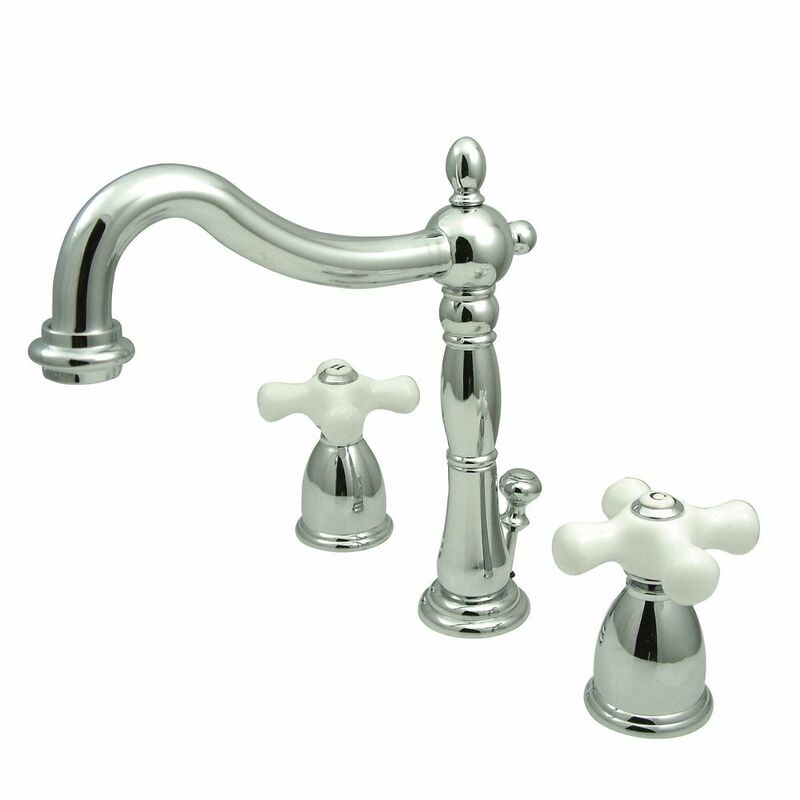 Add an Old World feel to your bathroom with this Victorian spout faucet. Constructed of metal, it is built to last for years. From the quarter turn handles to the widespread design; this will be the centerpiece to any bathroom. Classic style widespread faucet is constructed of a solid brass body for enhanced finish and performance. Victorian Widespread (8-inch) 2-Handle High Arc Bathroom Faucet in Chrome with Cross Handles Make your bathroom look like new with this chic, useful piece from Kingston Brass. Make your bathroom look even fresher with this dual-control faucet. Add more beauty to your bathroom with this item's easy-to-install, deck mounted design. This faucet is WaterSense certified so you use less water to get clean and help the environment. Victorian Widespread (8-inch) 2-Handle High Arc Bathroom Faucet in Chrome with Cross Handles is rated 4.2 out of 5 by 31. Rated 5 out of 5 by Doria from Love the look. Very unique. Plumber had no issues installing.... Love the look. Very unique. Plumber had no issues installing. Already lots of compliments! Rated 5 out of 5 by Gene from Plumbers installing it commented on the high quality of the faucet. Beautiful and functional. Plumbers installing it commented on the high quality of the faucet. Beautiful and functional. Rated 2 out of 5 by Anonymous from Very nice product, so nice our contractor will be recommending... Very nice product, so nice our contractor will be recommending to his customers. Rated 5 out of 5 by Patty from Difficult to put together, but the finished product is beautiful.... Difficult to put together, but the finished product is beautiful. Rated 5 out of 5 by Terri from Newly installed so I am unsure if it will hold... Newly installed so I am unsure if it will hold up. Looks fantastic and feel heavy duty, very pleased! Rated 5 out of 5 by James from The faucet was exactly what I was looking for. I... The faucet was exactly what I was looking for. I like the polished look as it fits with the rest of the fixtures in the bathroom. The handles are what I was wanting to give the pedestal sink the vintage look. I liked the fact that is brass and I expect it to holdup to daily use. Rated 5 out of 5 by HomeDepotCustomer from Looks amazing with the new quartz sink top.... Looks amazing with the new quartz sink top. Rated 5 out of 5 by TRose from This was a new faucet used in an antique bathroom remodel and coupled with a pedestal sink. Reall... This was a new faucet used in an antique bathroom remodel and coupled with a pedestal sink. Really nice quality and Hubs didn't remark on difficulty with installation. Nothing arrived broken and the faucet looks/operates great. One thing: the faucet handles are slightly smaller in the flesh that I expected them to be. Doesn't detract. Expensive but good value [when quality is considered].